Being a Fiduciary. Putting clients’ interests first. Always. Lifelong Learning. Staying on the vanguard of the profession in an age of acceleration; educating clients to make wise financial decisions. Beyond Yourself. Making the world a better place by serving as a steward of the environment and our community for our grandkids’ sake. Responsibility. Doing what we say we’re going to do and enabling clients to be accountable for the progress they desire. Authenticity. Being true to ourselves and honest with others to build long-lasting trusted relationships. Health. Taking care of mind, body and soul so that we remain strong for those who rely on us, now and in the future. Relationships. Valuing our connections so we thrive together. Treating clients like family. The markets are efficient most of the time. It is therefore difficult for active managers to outperform their indices consistently over the long-term. 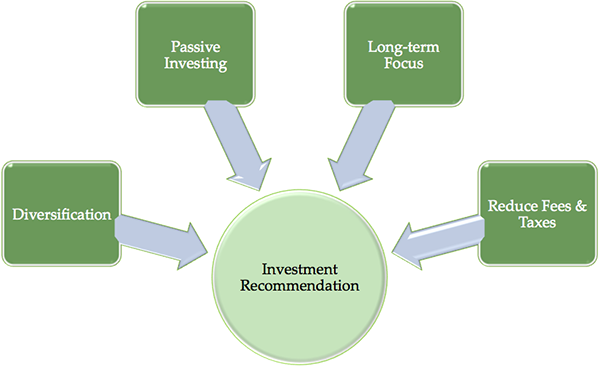 As a result, we tend to recommend passive index funds and ETFs for most asset classes. The only “free lunch” in the investment world is diversification. Though it works better at some times than others. This means that an investor can improve returns simply by building a portfolio of investments that have low correlation to each other (i.e., one zigs while the other zags). To take advantage of this phenomenon, we recommend fully diversified portfolios to our clients, including asset classes such as fixed income, US stocks, foreign stocks, real estate and commodities. As a result, we focus on long-term strategic allocations to asset classes and individual investments and do not frequently change our recommendations. We focus on minimizing expenses by using low-cost funds and trading infrequently. After-tax returns can be further improved with tax-loss harvesting and other strategies, such as the location of tax-inefficient investments in retirement accounts.